The solemn appearance of Moscow & District Pipe Band is always a bright, memorable event. The performance opens march defile with the sudden appearance and the motion through auditorium or scene. It is possible both the appearance from the backstage and any other variant, appropriate in the proposed accommodation or on the open space. At the end of a defile the pipe band forms up a figure. Depending on the space, the figures can be different: a row, 2 rows, “chessboard”, “ring”, “thistle”, “half moon”. 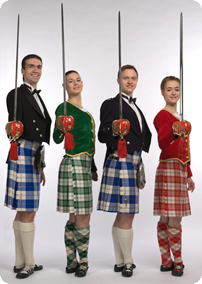 There are marches and dance melodies of Scotland into the program of the performance. The unique concert program, created by analogy with international festivals of military brass bands, - two bands meet on one scene: Moscow & District Pipe Band and the Central Band of the Ministry of Defense of the Russian Federation. In the program: march defile, forming-up of figures, solo performances of the bands. In conclusion of the program the bands converge into the consolidated set in order to play the most popular Russian and Scottish melodies. 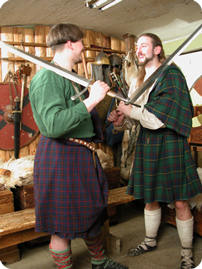 This version of our show is more interactive and includes, besides the performance of the band, the stage play: demo performances and sword straight fights, competitions and games with spectators, traditional dances. The program is created on the performance of Moscow & District Pipe Band and artists of Historical Reconstruction Club "Silver Wolf". Besides the living sound the phonograms of Irish and Scottish folk music are used in the program. This is a visual program, based on plenty of spectacular dances. Also it is suitable for corporate events. 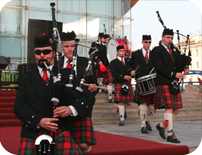 In the program: performance of Moscow & District Pipe Band and artists of the Scottish Dance School "Shady Glen". 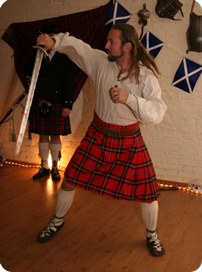 The traditional Scottish dances are demonstrated: pas seul - "Highland Dance", "Ladies' step"; twosome - "Ceilidh dance"; figure dances - “Country dance”. In addition to this, the program includes interactive dancing master-class. Dance show from Scottish Dance School "Shady Glen"